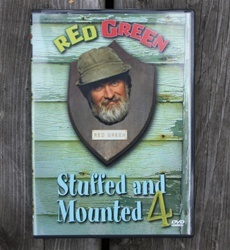 Our all-time most popular DVD's, each of these things contains eight Red Green episodes, made up of one episode from each of eight different seasons. Kind of like a sampler plate at a roadkill restaurant. While the individual seasons are also popular, the Stuffed and Mounted series gives you more of an overview of the whole series rather than an up close look at a specific year. Like old trucks and relatives, it's usually better when you don't look too close.